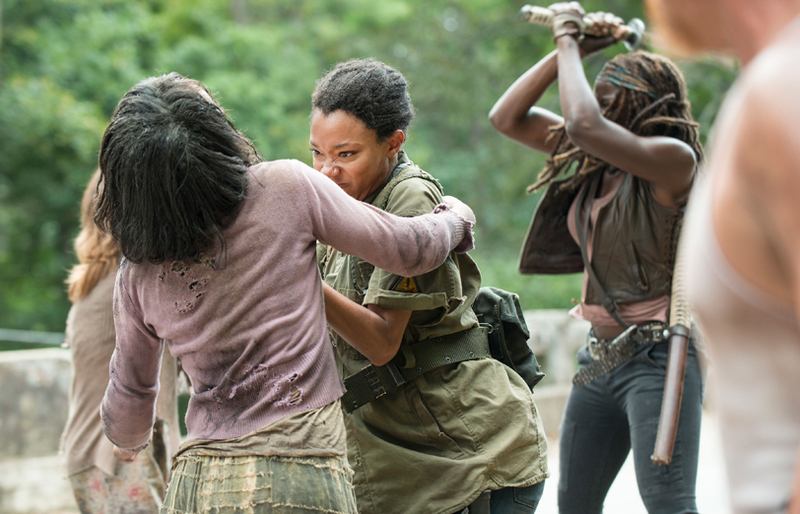 There is hope on the horizon for The Walking Dead's Sasha Williams (Sonequa Martin-Green). The former firefighter suffered two devastating losses last season, losing both boyfriend Bob Stookey (Lawrence Gilliard, Jr.) and brother Tyreese (Chad Coleman). When she arrived at the Alexandria Safe Zone, Sasha isolated herself from the rest of her group due to her post-traumatic stress disorder and intense grieving. However, she did find a role within the community by taking a shift at the guard tower, but she continued her violent outbursts against walkers after learning about Noah's (Tyler James Williams) death. While seeking comfort in the town's chapel, Father Gabriel (Seth Gilliam) accused Sasha of unnecessary killings, which led to a fight. After Maggie (Lauren Cohan) calmed the two parties, the three of them were last seen praying together for forgiveness. We spoke to Martin-Green about what's next in Sasha's journey and how she is able to find the light in Season 6. RELATED: What's Happening to Your Fave Walking Dead Characters? How would you describe Season 6? People are defining their individual worlds. People are finally getting to ask themselves, 'Who am I specifically, personally, by myself?' We've been so group oriented for so long, and now we're finally in a place where we can actually just be who we are when we're not under the gun or running from our lives. What is new with Sasha this year? We pick up with the next step, which is a step toward the light! It's been so dark for so long, oh my goodness, she needs help! And help came from that prayer and that forgiveness moment. It was really about self-forgiveness because she was condemning herself and guilt ridden, so she finally forgave herself, pulled herself out of that hole and decided to live life in a way that honored the ones she lost. So we see her starting a journey towards a Sasha that we have never seen before. She was always a very tough person, but it was always a defense mechanism. It was all just to keep herself from being penetrated so she wouldn't be hurt. After losing Bob and Tyreese, she has decided that she's changing and is going to live differently. Is she still affected by the losses of Bob and Tyreese? I think she carries everyone that she's lost. But before, she was carrying them in a way that bore her down into the ground, and now she's carrying them almost in a way that uplifts her. Have her attitudes towards Alexandria also changed? Well, she was an island of misery, basically. [Laughs] She didn't want to do anything with anyone who was laughing and smiling because to her, it was fake. It was this façade that she couldn't believe in at the time. There was also a lot of jealousy because they hadn't lost anyone. But now, with the veil being lifted, she does appreciate Alexandria, what it stands for and the people. Though they have different experiences, they're all coming together as a community now and are willing to sacrifice for it. What does she think of Rick's (Andrew Lincoln) public execution during the town hall meeting? Doing whatever it takes to survive is something that she's very familiar with. So there's a duality there because old Sasha would have done it as well and totally understands why you have to do that kind of thing. But now living a life that honors the ones she's lost, she's ready to pursue a different path, one that is maybe parallel to Tyreese's. It's almost like she'll walk around with WWTD—What Would Tyreese Do?—in her heart. Maybe even WWBD—What Would Bob Do? But is she still a fighter?